My daughter Natalie loves Disney Princess’ so when it came time to plan her 4th Disney Princess Tea birthday party there was no doubt on what she wanted. For our invitations we printed out a message in old english on some pink card stock. It read “You are cordially invited to attend a royal tea party with Belle, Snow White, and Cinderella at Natalie’s Castle. Please wear you finest princess and prince attire. 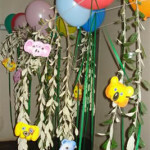 I then added all the party information and RSVP”. Then we rolled them up and tied a ribbon around like a scroll. We hand delivered them to all her friends. For our decorations we put up a garden background which we purchased at Celebrate Express along with all of our paper supplies and a few other decorations. For our tea party we covered the table with a table cloth, runners, candleabras, and flower vases. We even had chair covers on all the chairs to make it more formal. We had a few old sets of china and tea pots (you can easily find these at thrift stores to save money and for an older look). 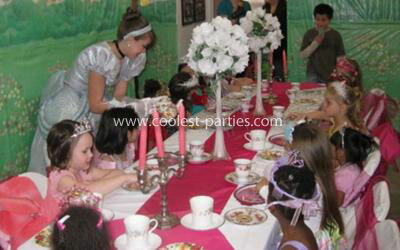 During the tea party all the kids sat around the table while our princess’ served them tea(punch) and cookies. 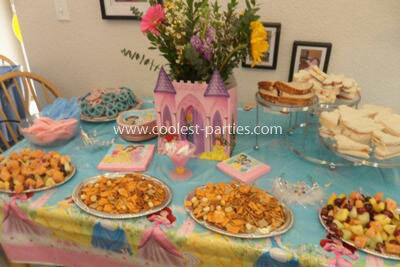 For our Disney Princess Tea birthday partyf ood and snacks we set up a separate table. As the centerpiece I took one of our old princess birthday bags and placed a vase of flowers inside it. We made small tea sandwiches. We chose kid friendly ones like pb&j, ham and cheese, and tuna salad. Then we used small heart cookie cutters to make them a little more unique. I made fruit kabobs with toothpicks with pink frill on one side. My friend made some of her famous chocolate covered pretzels in pink and blue to match the decor. Then had a few plates of Chex Party Mix served on silver platters (all found at the dollar store). We had the 3 girls from our local high-school who came dressed in princess costumes. We had many different activities during the party. We had face-painting and a bounce house set outside for the boys who came. Cinderella read all the kids a fairytale as we sat around the table waiting for lunch. After our tea party lunch all the princess taught the girls a special princess dance as we played music in the background from a Disney princess CD. During dessert they crowned my daughter “Princess For a Day” and gave her a crown, wand, and glass slipper. She had the biggest smile on her face being the center of attention. I made her a huge princess castle cake. The base was just a large rectangle decorated in green for grass and loads of flowers. I used ground up graham crackers for the path and put one of her princess carriage toys by the front door. The castle is rectangle and round cakes with cones for the pillars. I cut out the princess in windows from a game I found at the party store. It was the perfect addition to her party. For our Disney Princess Tea birthday party favors I bought plastic princes cups that you can find in every party section. We filled them with glitter Easter filler, notepads, crayons, jewelry, bendy straws and candy. Then I slipped the whole cup into a plastic treat bag and tied with a ribbon. Before all the kids left we took individual pictures of them with the princess’ in front of our flower backdrop. I found these awesome princess cards where you slide a picture in the front at the dollar store. I used these as our thank you cards and gave each of them their picture to remind them of this special day. Everyone had such a great time especially my daughter!!! 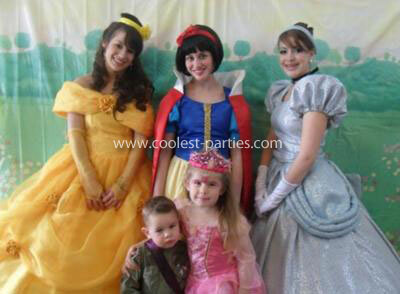 The photos you have of the princesses that went to your daughter party are not from a local high school. They are from a company call Dreams Come True Princess Parties. If you are in El Paso, TX then I would use Dreams Come True princess party. Her name is Teresa and her number is 915-566-4017 and also has a Facebook page. It’s great because she has a lot of the items needed for the party. And very reasonably priced. 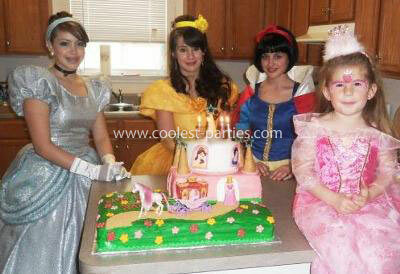 If you are in another city I would just google princess party. Some might not have anything like this it just depends on your area. I am going to attempt to make that cake. You did a execellent job in discription. I am feeling overwhelmed but after reading this I feel confident I can do it and on a budget!